It’s that time of year again! Time to hit up the stores and shop for the ones you love most. 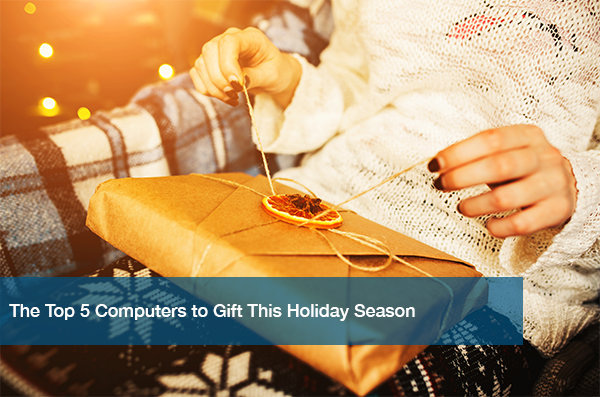 For the techies in your life, though, finding the perfect gift can be hard. There’s so many new gadgets and gizmos coming out at once, it’s easy to get overwhelmed with options! Last week, we talked about maintaining productivity during the Holidays which may be of help to you. If there’s one thing we’re experts at, however, it’s computers. That’s why we’ve put together a list of the best options out there currently. Whether you’re in the market for yourself or for a loved one, you’re sure to find the perfect computer this Holiday Season. This desktop has been drawing a lot of attention this season- and for good reasons. The color quality is brilliant, it has a touchscreen, and has two new style accessories. One of those accessories is the Surface Dial, which is a wireless knob input that makes creating simpler. Aimed at artists, its screen folds all the way down to look like a drafting table. While a bit pricey, it is definitely a look into what future desktops will look like. Even if you opt for the version with no Touch Bar, the latest from Apple is one of their best yet. Both new versions are slimmer and faster models, and include updated track pads and enhanced displays. Best of all? Both come with increased battery life. The Touch Bar and Touch ID offer you innovation and security into your laptop experience. It’s a splurge, but well worth it. Want to see some great OS Sierra features firsthand? Check out our video Best Features on MacBook Pro 2016 OS Sierra. If you’ve been on the hunt for a great 2-in-1 laptop, you’ve finally found the best one! HP decided to update and upgrade their last x360 model and make it slimmer and quicker. Reviews everywhere state that it’s one of the longest lasting machines ever created. The price matches the value you’ll get out of this computer. This tablet-laptop hybrid is in a league of its own. It offers improved graphics and a swanky hinge that makes it easier to transform into tablet mode. The battery life is crazy, and is twice as fast as the original Surface Book. On a tighter budget? Here’s your best bet. While the battery life isn’t amazing, the touchscreen and enhanced touchpad features make up for it. It also has a face-recognizing camera, something that not a lot of computers have. No matter your budget, profession, or brand preference, there’s a computer out there for you. It’s important to remain informed on what’s out there so you get value out of your purchase. Now that you have the tools to help you find the best computer, good luck and Happy Holidays! Whether you go with a PC or Mac, ITC Austin can help. We help businesses all over Texas by providing managed IT services. This can save your business time and energy, and can increase your productivity. Head over to our website to get a free IT needs assessment today.